Panama Canal expansion a lull before the storm? North American West Coast ports are keeping a wary eye on the long-awaited Panama Canal expansion which should be completed in 2015 despite financial woes and delays. However, in 2014 for every port worried about the threat of increased competition and losing business to East Coast North American ports, there’s another just as convinced that the canal expansion may only allow that Central American country to maintain its business levels rather than steal trade away from West Coast ports. The further north up the West Coast the port is, the less the concern appears to be about Panama Canal expansion and from about the Port of Portland onwards, there’s more concern by United States ports over increasing competition from expanding Canadian ports. And no wonder as both Port Metro Vancouver (easily the busiest West Coast North American port with total throughput of 135mt [million tonnes] in 2013) and the expanding Port of Prince Rupert — a day’s sailing closer to Asia than Californian ports and boasting a 450% increase in profit since 2010 — had record years in 2013. But, the $5.3 billion Panama Canal expansion bringing wider, deeper channels and new locks at both the Pacific and Atlantic ends is now 75% complete and could spring a surprise or two yet as it struggles to overcome a current $1.6 billion cost overrun with international arbitration now in effect and some interim stopgap financing agreed to push the project along through its Spanish-led European Construction consortium, Grupo Unidos por el Canal S.A. (GUPC). The current period on the North American West Coast may well be looked back on in future years as the lull before the storm. After all, the intention from day one has been to “transform Panama into a first world country” and set up the city port there in strong competition with Miami as “the commercial gateway to the Americas” and in time big enough to rival Hong Kong. All of which won’t be sitting well with some East Coast ports in the United States that have spent billions of dollars dredging and expanding facilities and equipment to cater for the larger ships that will pass through the Panama Canal. Currently, the canal can handle container vessels of 5,000 TEUs (20-foot equivalent units), but the expansion will more than double this capacity to 13,000 TEUs. On the West Coast, there’s some comfort in the Port of Long Beach, at least, that the expanded canal will still not be able to handle the larger 13,000 to 18,000 TEU ships. Several of the North American West Coast ports already boast being ‘big ship ready’ and note how shipping lines are consolidating their operations which will mean larger ships and fewer ports of call in future. Up and down the West Coast, all competition is taken seriously and the opening of the expanded Panama Canal in 2015 is serving as a riveting point of focus. Here’s Dry Cargo International’s annual review of North America’s major West Coast ports from south to north and how each fared in 2013 and year to date (YTD) in 2014. Even after a weak first quarter of 2014 because of poor weather elsewhere, the Port of Long Beach is hanging in there with a 1% climb through the end of April over the same period a year earlier.The No. 2 ranked port on the West Coast of North America recorded a throughput total in 2013 of 64,094,386 tonnes, still well ahead of rival Port of Los Angeles. Containers continue to dominate trade and they totalled 6,739,573 TEUs in 2013, up 11.3% and were up in exports, imports and even empties through April 2014. Inside those boxes, home appliances climbed by 243% in 2013 over 2007 levels, but home electronics slipped by 44% in the same period and paper and paper products dropped by 40%. The merger got a quick dismissal by local port officials. The Port of Los Angeles, which has been ranked the ‘nation’s busiest port’ when it comes to containers since 2000, acknowledges it faces competition on many fronts — ‘other West Coast ports, Canadian ports, new terminals in Mexico and East Coast ports/ Panama Canal’ — and has just come through a tougher patch. The port experienced a drop of almost 5.5mt in throughput from its record total in 2012, finishing up 2013 moving 50,670,753 tonnes. There is a brighter outlook, however, through the end of April with total throughput up 8.2% compared to the same period of 2013. Containers dominate traffic statistics, reaching 7.9 million TEUs in 2013 (a record 8.5 million TEUs was set in 2006) and cargo value reach $285 billion — no wonder Los Angeles is the top Customs office in the nation. The port relies heavily on Asian trade with China/ Hong Kong dominating its traffic statistics. Like its rival Port of Long Beach, the Port of Los Angeles is in the midst of its own $1.1 billion capital improvement programme, investing in cargo terminal improvements as well as roads and other infrastructure. A $383 million thrust in this programme is aimed at reducing and separating port truck traffic from public roadways. A $155 million Berth 200/ Pier A/ West Basin Railyard project when completed will eliminate 2,300 daily truck trips from the Long Beach 710 and Harbour 110 Freeways. New container business came in the form of United Arab Shipping Line starting LA service. The port is already big ship ready with a 53-foot draught. On the environmental front, the Port of Los Angeles regards itself as a global leader and has reduced diesel particulate matter over the past five years by 79%, nitrogen oxides by 56% and sulphur oxides by 88% through such schemes as alternative maritime power, more environmentally friendly cargo handling equipment, and a Clean Truck Program. create a world-class trade and logistics centre with over one million square feet of new warehouse space where exports and imports will be offloaded and repackaged. The next phase will include enhanced near-dock rail, an intermodal yard, and cold storage and logistics facilities. At 10,829,590 tonnes handled in 2013 (down 3.4%), the Port of Portland in Oregon relies heavily on bulk for its success, led by potash from Canada and soda ash from Wyoming. Several western states ship grain through the Columbia River port, which is situated 70 miles east of the Pacific Ocean. Container traffic at 178,451 TEUs ranked third last year overall in tonnage, followed by iron and steel imports from Russia, Mexico and Canada. Seven companies ship autos through the port and in a switch, US vehicle exports began to South Korea in 2012 and China in 2013. Other commodities include liquid bulk imports (agricultural fertilizers) and project cargoes such as generators, turbines and transformers. This year through April, the port’s tonnage is running 9.4% ahead of the same four months of 2013 with container traffic slumping by nearly 12% (a lingering dispute between unions nearly cost Portland its major customer Hanjin Shipping but the port offered incentives and the line stayed). This past April was the highest single month for break bulk in over a decade and export auto volumes by then had already eclipsed the entire 2013 total. Recent port improvements include a new terminal entrance road, rail upgrades and the removal of old equipment from two terminals for salvage. Columbia Grain has a $40 million expansion underway. 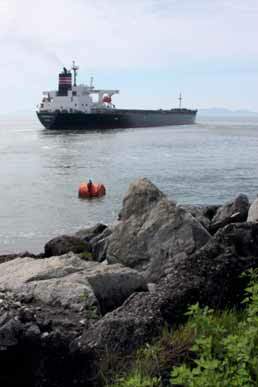 The Portland Bulk Terminals/Canpotex is buying a $30 million new shiploader and is mulling further expansion. Kinder Morgan/ANSAC built a new $9.5 million shiploader and has expansion plans before the Port Commission. A port tenant is now handling sulphuric acid at Terminal 4 and larger scale roll-on/roll-off business is being planned at Terminal 6. Bulk, break bulk and autos are being targeted by the port to spearhead future growth. Just across the Columbia River from Portland, Port Vancouver USA in Washington shipped 4,480,605 tonnes in 2013 and that was down 1.6% from 2012 volumes. As one of the few ports on the West Coast that doesn’t handle containers, the expanded Panama Canal is not seen as a threat with the main competition coming from Californian ports and the Mexican Port of Guaymas. Dry cargoes handled in 2013 were dominated by agricultural exports such as corn, soybean and wheat (2,809,103 tonnes) but also included lesser amounts of imported bauxite (6,232 tonnes), export bentonite (99,457 tonnes), and other exports including copper (366,206 tonnes), and mill scale (22,164 tonnes). YTD through April saw total throughput at 2,089,634 tonnes and that was a significant increase (47%) over the same period a year before thanks largely to increased shipments of agricultural products through the port’s elevator. In 2014, Port Vancouver USA welcomed back urea import shipments after a six-year hiatus and is expecting its best year for the commodity. In July, the port expects to handle its first shipment from the Far East of ceramic proppants used in fracturing and heading to the US and Canadian hinterland, especially North Dakota. The river port is past the midway point in a 10-year, $275 million rail improvement project to increase cargo handling speed and efficiency by taking rail track from 17 to 52 miles, boosting unit train receiving and dispatching, and adding a new entrance direct from the Burlington Northern Santa Fe main line. The third year of declining TEUs in 2013 at 1,592,753 (2010 was the best recent year at 2,153,685 TEUs) has some pushing the merits of a merger with Puget Sound rival the Port of Tacoma. Earlier this year, the Federal Maritime Commission approved a request from the two ports to begin information exchanges aimed at boosting container traffic. In 2013, the Port of Seattle moved 16,011,122 tonnes — its worst year in a decade — after losing some container business to Tacoma. Grain and molasses shipments were down, while petroleum was up but still below the performance of most of the past decade. YTD figures through April saw TEUs in decline by 5.3%. In May, the Port of Seattle and Eagle Marine Services, operator of Terminal 5, tentatively agreed to relocate its cargo and break bulk to another facility so that Terminal 5 can be made ‘big ship ready’. The port has also received federal approval to let the US Army Corp of Engineers study the potential of deepening the West Waterway Channel near that facility. Throughput in 2013 for the Port of Tacoma came in at almost the same numbers as 2012 recording 16,238,606 tonnes, including 1.9 million TEUs. This year is zinging along with container volumes in April up 10% over the same month in 2013 and YTD figures through April for boxes up 3% at 633,225 TEUs. China/Hong Kong and Japan dominate trade with Tacoma with grain leading the bulk goods at 2.44mt. The pace has continued for grains this year and exports shot up 31% through April as volumes appear to be returning to normal after a severe drought in 2012 in the US Midwest and increased competition from South America. Auto imports and break bulk cargoes also show YTD increases, but log exports fell 32% as the housing market slowed in China. Last year, the port made a switch to break bulk operations at its East Blair One Terminal (rail will be expanded onto the terminal later) and work is underway in a $20 million project strengthening the Pier 3 at Husky Terminal and adjacent Pier 4 so they can handle larger cranes and 18,000 TEU vessels. In June, the Port Commission approved $5.8 million for work associated with the reconfiguration of the two piers into one stretching 2,960 feet. Competition is very much on the Port of Tacoma’s mind and even though it is now sharing information and co- operating more than ever with rival Seattle, there have been no formal merger talks . . . except in the news media. With its best year in history in 2013 at 135mt — up 9% over its 2012 record of 124mt — Canada’s largest port is also the most diversified on the West Coast of North America. In 2013, Port Metro Vancouver, which handles 19% of the nation’s trade or half a billion dollars in goods daily, increased both imports and exports by the same 9%. Container volumes increased by 4% to a record 2.83 million TEUs, while bulk — largely coal, grain and fertilizers — were up a combined 11% at 92.7mt. Coal had an excellent year up 17% at a record 38.1mt, while wheat was up 26% at 7.6mt, barley up 273% at 401,822 tonnes, and specialty crops up 58% at almost 3mt. Wood chips had a healthy year up 7% at 7.5mt; potash was up 20% at 6.9mt, and chemicals, basic metals and minerals at 11.2mt were up 15%. Needless to say the port had a 12% increase in overall revenues and continues to enjoy an AA credit rating. YTD through April saw coal shipments — the major bulk item — keeping pace with the same four months a year earlier, chemicals, basic metals and minerals up 26.5% and grain up 1.6%, but forest products (down 14%), petroleum (down 17.4%), and total shipments down 2.5%. Container traffic was on about the same pace as last year despite a pesky truck strike. PMV doesn’t see the expanded Panama Canal as a threat — most of its import containers are heading by rail to Eastern Canada and a southern all-water route would take considerably longer and bring no cost savings. Not all is sweetness and light, however. Even though it has been successfully moving coal exports for 44 years, PMV finds itself up against organized opposition — including municipalities, health officials, environmentalists and other activists — over a $15 million Fraser Surrey Docks proposal to receive US coal from the Powder River Basin by rail and then barge it along the Fraser River to an existing export facility on Texada Island in the Strait of Georgia for offload onto deep-sea ships bound for Asian markets. The port, as the sole approval authority, has asked Fraser Surrey Docks for a wider health review as part of the environmental impact review and has yet to make its decision on the proposal. Port Metro Vancouver President & CEO, Robin Silvester, has probably been asked more questions about the proposal to move US coal than any other question in the past year and has repeatedly said the port is one link in the coal supply chain running through national and provincial decisions to develop Canada’s abundant natural resources and “cannot dictate what is exported.” As widespread opposition continues in the Pacific Northwest to increased coal shipments, it is no wonder that efforts on the US West Coast to develop their own coal export terminals over the past couple of years have gone from about seven separate projects in Washington and Oregon down to only three with nothing certain anytime soon. On the environmental front, Port Metro’s EcoAction Program is reducing marine emissions — exceeding current North American Emission Control Area requirements — and in 2013 some $1.2 million was given in discounts to vessels going beyond current emission requirements. The darling of British Columbia trade with seemingly more success stories in recent years than any other port on the continent, Prince Rupert enjoyed another record year in 2013 at just over 23mt, up 3.4% over a record year in 2012. Rivals will delight that the going is a little tougher so far in 2014 with YTD to the end of April showing containers down 1.07% over the same four months of 2013 and coal exports off 22.4% at 2.9mt. The good news is that grain was up 4.5% (including record volumes of canola up 32% over 2012 levels) and tonnage from a recently opened wood pellet terminal at 131,897 tonnes YTD was helping offset declines in other commodities. With its secure rail links to and from the US Midwest and location a day sailing closer to Asia than most US West Coast ports, Prince Rupert doesn’t see the Panama Canal as a serious threat. Along with the new Westview Wood Pellet Terminal, other capital works abound including the $200 million doubling of capacity at Ridley Terminals, the ‘up for sale’, federally-owned coal export facility; a $90 million rail and road corridor to increase capacity between Ridley Island the Prince Rupert’s city mainland should be completed by October; and the sole container mover, Fairview Terminal is up for major expansion should operator Maher Terminals see value in the commercial investment to take capacity from the current 850,000 TEUs to 1.3 million TEUs. But, that’s just the start. Two proponents have rival liquefied natural gas plant plans for port lands — Pacific NorthWest LNG through Petronas and Prince Rupert LNG through the BG Group — and could spend $20 billion between them getting up and running. One is at the feasibility stage and the other is amid its environment assessment. The prospects of developing a former pulp mill and deep-sea dock site at Watson Island near Ridley Island into a modern, multi-product facility is tangled in yet another legal dispute, this time between would-be developers Colonial Coal International, of Vancouver, and its WatCo subsidiary and the City of Prince Rupert.